The design of this garden was the customers own. With just a couple of little tweaks we were able to create exactly what they had asked for. The aim of this project was to create a 2.4m circular patio with two circular turfed areas of the same size. the existing patio was to be doubled in size and the pathway extended. 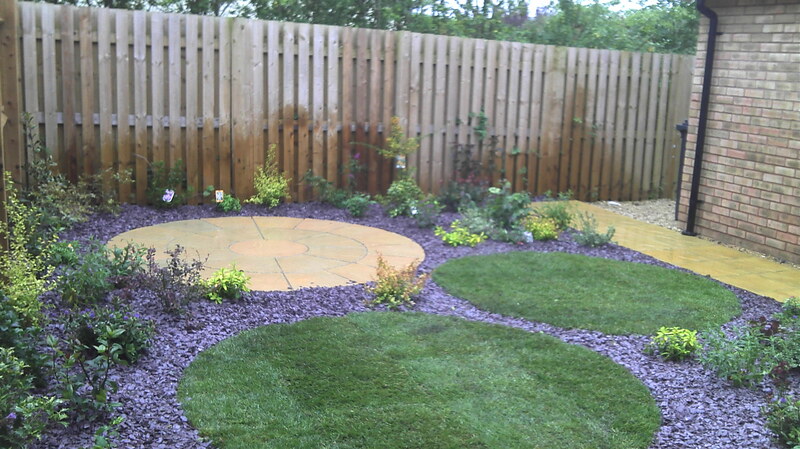 Once the hard landscaping was complete the remaining area was to be planted out and dressed with decorative plum slate. Our first job was to measure out and mark where the three circles were to go. We then started to prepare the patio area that we were going to extend. We dug out to the depth of approximately 120mm so we could lay and compact the scalpings. Once the preparation work was complete we set about laying the slabs for the patios and path. The slabs were set onto a bed of mortar. We broke this job into two phases the first phase being the hard landscaping. As you can see from the pictures both above and below we completed the patio's and slabbing (despite the rain) before moving on to phase two. Phase one was completed by two people in three days. Phase two is the soft landscaping, we laid out the plants so we knew exactly where they were going to go and ensure that the end result would look as we hoped it would. Once we were happy with the location of all the plants, we laid a good quality weed suppressing fabric, planted the plants and top dressed with decorative plum slate. The remaining two 2.4m circles were laid with turf to complete this project. Phase 2 took two people two days to complete. Another successful job brought in both on time and in budget!